In a 2 April 2014 image, looting on a massive scale is visible at Dura-Europos, with high-density looting (red) visible in the vast majority of the site enclosed by the ancient city wall. 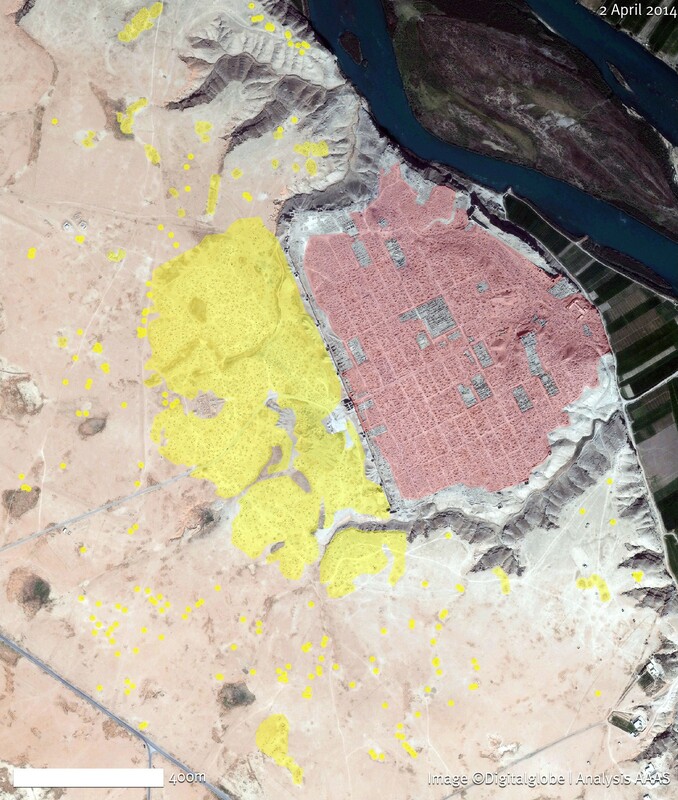 In the archaeological areas beyond the wall, highlighted in yellow, the pits are less dense, but similarly extensive. Coordinates: 34.74 N, 40.73 E. Image ©DigitalGlobe | U.S. Department of State, NextView License | Analysis AAAS. Recent reports have confirmed damage to five of the six Syrian world heritage sites during the current armed conflict as well as extensive looting of several of its archaeological sites on the Syrian Tentative List of world heritage. This article examines the role and fate of Syrian world cultural heritage from the beginning of the conflict, maps out the different cultural property obligations applicable to Syria while illustrating, where possible, how they may have been violated. Then, it assesses if and how those responsible for these acts can be prosecuted and punished. The analysis reveals an accountability gap concerning crimes against Syrian world cultural heritage. As such, the article proposes to reinstate the debate over crimes against common cultural heritage which once arose in the context of the Buddhas of Bamiyan. Marina Lostal. (2015). Syria’s world cultural heritage and individual criminal responsibility. International Review of Law: Vol. 2015 1, 3.